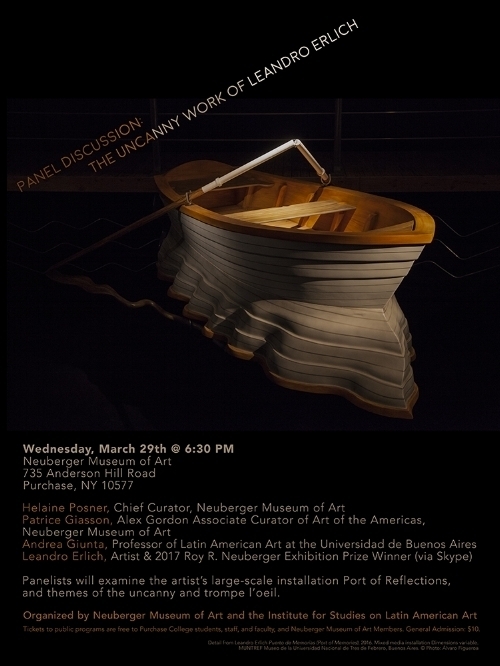 Andrea Giunta, author of exhibition catalogue essay “A Gap in the Limits of the Possible” and Professor of Latin American Art, Universidad de Buenos Aires will discuss the work of Argentinian artist Leandro Erlich, 2017 Roy R. Neuberger Exhibition Prize awardee with curators Helaine Posner and Patrice Giasson. Panelists will examine Erlich’s large-scale installation, Port of Reflections, his historical relevance, and themes of the uncanny and trompe l’oeil. The artist will join the final thirty minutes of the conversation via Skype for a Q&A with the audience.